It was on this day 35 years ago - 2 March 1981 - that Ali, then 26, had a letter published in The Guardian newspaper, which led to her life taking a direction totally different from what she had expected. The letter expressed Ali's objection to the practice, that had been reported widely, of sedating and starving to death new-born disabled babies. Sir, - I refer to your article Deformed Babies Allowed to Die, Doctors Admit (February 25). I am 26 years old and was born with Spina Bifida. As far as my own case is concerned, I am fairly severely handicapped and confined to a wheelchair, so I am not sure a similar case would now be selected to live. Nevertheless I feel that my life has been worthwhile and enjoyable, and that I have achieved a measure of success. 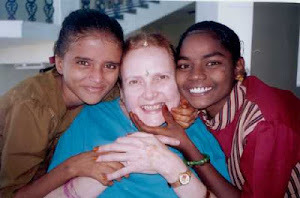 I have travelled widely with my husband, and been to university and gained a degree. 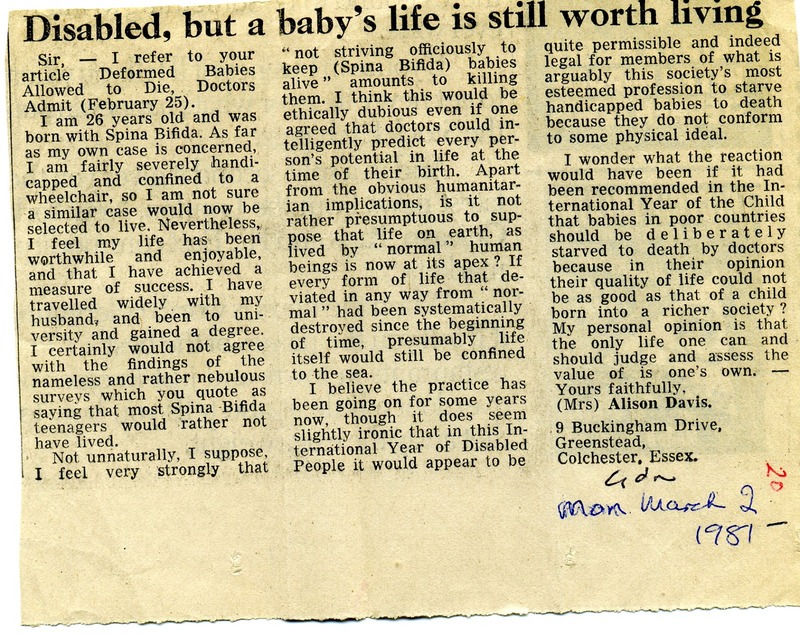 I certainly would not agree with the findings of the nameless and rather nebulous surveys that you quote as saying that most Spina Bifida teenagers would rather not have lived. Not unnaturally, I suppose, I feel very strongly that "not striving officiously to keep (Spina Bifida) babies alive" amounts to killing them. I think this would be ethically dubious even if one agreed that doctors could intelligently predict every person's potential in life at the time of their birth. Apart from the obvious humanitarian implications, is it not rather presumptuous to suppose that life on earth, as lived by "normal" human beings is now at its apex? If every form of life that deviated in any way from "normal" had been systematically destroyed since the beginning of time, presumably life itself would still be confined to the sea. 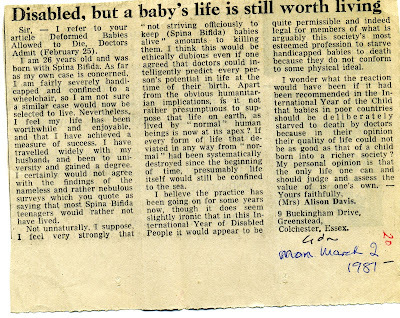 I believe the practice has been going on for some years now, though it does seem slightly ironic that in this International Year of Disabled People it would appear to be quite permissible and indeed legal for members of what is arguably this society's most esteemed profession to starve handicapped babies to death because they do not conform to some physical ideal. I wonder what the reaction would have been if it had been recommended in the International Year of the Child that babies in poor countries should be deliberately starved to death by doctors because in their opinion their quality of life could not be as good as that of a child born into a richer society? My personal opinion is that the only life one can and should judge and assess the value of is one's own. After the letter was published Ali received nearly 100 letters responding to what she had said. Several of them were from pro-lifers who made the point that the fatal discrimination against disabled babies was an extension of the mentality that promoted screening for disability followed by abortion, so that disabled unborn children would never even get to see the light of day. At that time Ali was pro-abortion and did not have a good opinion of pro-lifers. Nevertheless, she was intellectually honest and considered the arguments presented to her. She spent time checking out material in the university library and found the pro-life arguments irrefutable. 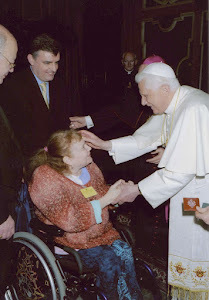 Within a couple of years she was working for the Society for the Protection of Unborn Children. Inevitably, one's thoughts develop as one gets older. While continuing to hold the view that nobody has the right to judge negatively the value of anybody else's life, Ali subsequently did not hold the view, indicated in the letter, that the value of one's life is subjective. She held that life is precious - indeed of infinite value - even if at times one may not actually recognise that is the case. In later years she would never say that the 'worthwhileness' of her life - or of anyone's life - lay in any achievements or successes she may have enjoyed; such things were, she believed, incidental given the intrinsic value of each human life. About ten years after the letter was published Ali and I were at a pro-life meeting and a woman, who was unknown to Ali, approached her. She took a folded up piece of paper out of her purse, and showed it to Ali. It was the letter Ali had had published in The Guardian. The woman said it had made a deep impression on her and she had cut it out and kept it in her purse since then. Thanks Ian - it's good to get such details which only you could give! I'll be in touch. All the best, Colin.